The third book I finished this year satisified the 13th category on the reading challenge list - a self-improvement book. I sincerely wanted to be improved by this book. I was on the library waiting list for probably a couple months before I received this book as a gift. It was not all I hoped it would be. 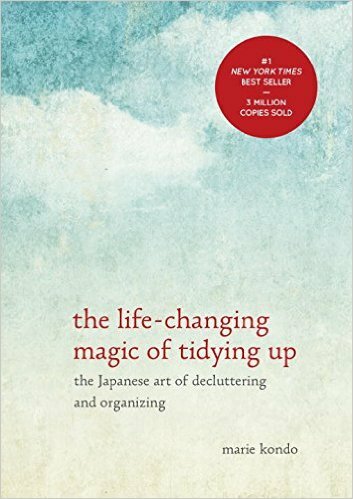 The Life-Changing Magic of Tidying Up by Marie Kondo mostly sounded just ridiculous to me. I wanted to like it. I wanted that 'aha' moment when I would suddenly throw down the book and run to start tidying. I got as far as my shoes, which are primarily mixed with the rest of my family's shoes. I got rid of a lot of my old shoes that didn't bring me joy. I got rid of my children's shoes that didn't bring me joy. But I didn't feel right doing anything with hubby's shoes, so the ones that didn't have a match in the shoe closet ended up in the clothes closet, and his sandals are still in the shoe closet with everyone else's winter boots. See, the author is obviously single. Tidying just my stuff? Sounds like fun, actually. Tidying four people's stuff, because if I just tidy mine nothing will look any different? No, thanks. My real laughing started in chapter four - "Storing your things to make your life shine." She recommends that you 'Empty your bag everyday.' Yeah. Like come home (usually five minutes later than I'm supposed to be leaving on my next errand) and take out your identification, your bus pass, your company identification, and put them in a special box. Then put your bag away as well so it can rest. Huh? Later on the same page, she says it's all right if you can't empty your bag sometimes, and admits, "...there have been times when I came home and fell asleep on the floor without even changing my clothes." Seriously? My bag may only get emptied once a year or so (to get the receipts out of the bottom for tax time..), but I sleep in a bed every night. Sorry, I digress. Anyway, this book was obviously not for me. I know it was very popular when it came out, and I've heard people swear by her methods, but I just really couldn't take it seriously. She'd probably say it's some defensive flaw deep in my psyche, but I'm okay with that. I tried reading this book too, and didn't enjoy it. It was laughable. I did try to do the "roll-up" method with Joel's clothes, but he didn't like it, so I had to put everything back. It did leave a lot more room for his stuff. I didn't make it to the emptying your purse everyday part. Yeah right. I need to tidy up, but this book definitely was not the way to do it. I bought this for you for Christmas. Lol. I'll find it when I get home lol. My take away was simplicity and minimalism. Something I'll work on til the day I die lol. The less you have the more you appreciate it and take care of it. I heard someone say this book could have been condensed into a pamphlet. Thanks for your honest review and good luck with your reading challenge. Is this the book that tells you to do things that "bring you joy"? If so, my mom and aunt just read it :) my mom said she liked it. Interesting title, anyways. I am really interested in this book. I've heard such mixed reviews. I loved this book! It made me want to throw away everything in my house! That does sound pretty funny. I love using Flylady! Haven;t heard about this book until today. The title seems interesting but your review says the exact opposite? I might check this personally soon. I'm so bad at tidying up and my kids are like miniature tornadoes when it comes to messing up the house so I'm really intrigued by this book.